Abstract A rational triangle is a triangle with rational sides and rational area. A Heron triangle is a triangle with integral sides and integral area. In this talk we will see that there exist infinitely many rational parametrizations, in terms of t, of rational triangles with perimeter 2t(t+1) and area t(t2-1). As a corollary, there exist arbitrarily many Heron triangles with all the same area and the same perimeter. The proof uses an elliptic K3 surface with Néron-Severi group of rank 18. An abstract is avalable in PDF. Hendrik Lenstra invites all participants for a drink in his new apartment (Hooigracht 84A, Leiden) at 17:00. At 18:30 we will have dinner in a restaurant nearby. February 13 Utrecht, room K11 of the Math building: joint session with the Algebraic Geometry seminar. An abstract is available in PDF. Abstract: which pairs (P, C), in which P is a point and C a reduced plane cubic curve, have the following property: almost every line through P yields four points (P, P1, P2, P3), namely P and the intersection points of C with the line, and for some permutation of these points the cross ratio they define is independent of the line. The talk answers this question and a generalization of it to curves C of higher degree. 13:00-14:00 Harm Voskuil, Amalgams and discrete subgroups of PGL(2,K). Abstract: The classification of amalgams of finite groups that can be embedded as discrete subgroups into the group PGL(2,K) over a local field K is discussed. The main focus of the talk is on the exceptional groups in characteristic zero that give rise to coverings of the projective line with only three branch points. Such groups only occur when the characteristic of the residue field is 2, 3 or 5. Abstract: We will consider Calabi--Yau threefolds defined over Q in weighted projective 4-spaces obtained from hypersurfaces of Fermat type via the orbifolding process. These motives are all of CM type. We will introduce motives associated to them, and then compute motivic Hodge numbers, Betti numbers and Euler characteristic. Finally, we calculate the L-series of Calabi-Yau threefolds. March 5 Leiden room 312. Abstract: As an analogue of modular equations for the $j$ function we also have modular equations for the Weber functions. These Weber functions are defined as quotients of the Dedekind eta function. I will speak about one use of the modular equations for these functions, namely obtaining explicit generators for Hilbert class fields of imaginary quadratic fields. Further to this, generalizing the Weber functions to various sets of `higher level' functions, I have been able to obtain some new modular equations and thus further explicit generators of Hilbert and ring class fields. The talk will start with what is known classically and finish with some explicit examples of my new higher level functions, their modular equations and some explicit eta quotient evaluations arising from them. 14:15-15:15 Jan-Hendrik Evertse, On the number of equivalence classes of binary forms of given degree and given discriminant. Abstract: Two binary forms (homogeneous polynomials) F(X,Y) and G(X,Y) with rational integral coefficients are called equivalent if F can be transformed into G by means of a transformation from GL(2,Z). Two equivalent binary forms are known to have the same discriminant. By classical work of Gauss, the binary quadratic forms of given discriminant with coefficients in Z fall apart into finitely many equivalence classes. Hermite proved the same for binary cubic forms of given discriminant with coefficients in Z. In 1972, Birch and Merriman succeeded to prove that the binary forms in Z[X,Y] of given degree r larger than 3 and of given discriminant lie in only finitely many equivalence classes. The proof of Birch and Merriman uses among others the theorem of Siegel, Mahler and Lang that if G is any finitely generated multiplicative subgroup of the field of algebraic numbers, then the Diophantine equation x+y=1 has only finitely many solutions in x,y from G.
In my lecture I will discuss a quantitative version of the result of Birch and Merriman giving an explicit upper bound for the number of equivalence classes. This is joint work with Attila Bérczes and Kálmán Györy (Debrecen). Abstract: We will discuss mirror symmetry proper for a mirror pair of elliptic curves, $K3$ surfaces, and Calabi-Yau threefolds. Lian and Yau formulated the so-called Mirror-Moonshine conjecture. We will discuss a couple of examples where mirror maps are McKay-Thompson series arising from Monstrous Moonshine. Abstract. Let q>5 be a prime number. The automorphisms of the modular curve X(q) are modular and their group is isomorphic to PSL_2(Z/qZ). In 1982, I. Kuribayashi showed that the automorphism group of X(7) modulo 3 is PSU(3,3) and A. Adler in 1997 showed that the automorphism group of X(11) modulo 3 is the Mathieu group M_11, a sporadic group which contains strictly PSL_2(Z/11Z). May it happen for other values ? We give a partial answer (negative) : if X(q) modulo p is ordinary and p>3 the automorphism group is exactly PSL_2(Z/qZ). We also completely answer the case q=7,11,13. Abstract. This equation is a special case of the Generalized Fermat Equation xp + yq = zr It is especially interesting since it is the extremal ``hyperbolic'' case: c = 1/p + 1/q + 1/r - 1 has the negative value closest to zero. For negative c, it is known that the equation has only finitely many primitive integral solutions, and the closer c is to zero, the more solutions are expected. I will report on the proof (done jointly with Bjorn Poonen and Ed Schaefer) that the list of known primitive solutions is complete. The proof involves the explicit construction of ten twists of the Klein Quartic whose rational points cover the primitive solutions. This is done using ideas from the proof of Fermat's Last Theorem and a fairly recent result by Halberstadt and Kraus on twists of X(7). In a second step, the set of rational points on each of these ten curves has to be determined. To achieve this, we set up a 2-descent on the Jacobian to determine the Mordell-Weil rank. In nine out of the ten cases, the rank is at most two, and Chabauty's method can be applied to find the rational points. In the last case, the rank is three, and we use a sieving argument on the Mordell-Weil group to rule out the existence of rational points leading to primitive solutions. April 23 Nijmegen, Room N5 (N0011). To see where to enter the building please look at the map. The room is in section N1, and you can enter the building at the green arrow and the pink dot. Abstract: The two most important quantum algorithms to date are Shor's algorithm for factoring and Grover's algorithm for search. Grover's algorithm allows us to search through a space of N elements in about √N steps, which is quadratically better than classical brute force search. Though its speedup is not as impressive as Shor's (quadratic vs exponential), its wide applicability makes up for that. In this talk we will explain Grover's algorithm, give a simple analysis to show that it works, and prove that its running time is essentially optimal. Time permitting, we will then describe a number of applications to other computational problems. Abstract: The goal of this talk is to give some ideas why and how quantum effects can be used to construct cryptographic schemes that are provably secure against an all-powerful adversary. We do this by presenting the quantum key-distribution protocol due to Bennett and Brassard (1984). This protocol allows two parties to agree on a cryptographic key, merely by communicating over public (classical and quantum) channels, such that any attacker (that may observe the full conversation) has essentially no information about the established key. Abstract: A theorem of Euler states that a product of four terms in arithmetic progression is not a square. A theorem of Erdös and Selfridge states that a product of two or more consecutive positive integers is not a power. I shall give several extensions of these results. Abstract: This talk will be an introduction to Iwasawa theory. We will sketch a proof of Iwasawa's main theorem and state Iwasawa's main conjecture. In this way we will have some preparation and motivation for Bill Hart's talk about modern Iwasawa theory. 15:15-16:00 Bill Hart (Leiden), What is the non-commutative Iwasawa Main Conjecture? Abstract: Recent progress has been made in the formulation of a non-commutative Iwasawa main conjecture by Coates, Fukaya, Kato, Sujatha and Venjakob. This elegant approach (which the speaker was *not* involved in personally) was discussed at the recent Iwasawa 2004 meeting by Coates, at which the speaker was present. 1) Where does non-commutative Iwasawa theory come from? 2) Some non-commutative algebra (pseudo-nullity, Auslander regular rings, p-adic lie groups). 3) Introduction to K-theory and characteristic elements in non-commutative Iwasawa theory. 4) The non-commutative main conjecture. All relevant definitions will be given, so the talk is intended for a general number theoretical audience. October 22 Groningen, room H 12018 in the "Harmoniegebouw", close to the main entrance. From the train station to the Harmoniegebouw is a straight walk of ≤ 10 minutes. Cross the musuem bridge in front of the train station; keep walking in the same direction, crossing some streets and the Vismarkt until you are in the Kijk in 't Jatstraat. The Harmoniegebouw is on your left hand side; see the map. 11:15−12:00 M. van Hoeij, Factoring polynomials over global fields. Abstract: Let K be a global field and f in K[X] be a polynomial. An efficient algorithm is presented which factors f in polynomial time. Abstract: We study a differential system ramified in 4 points depending on parameters and whose differential Galois group is a subgroup of the infinite dihedral group. The differential Galois group is either a reducible group, a finite dihedral group or the infinite dihedral group. We give a method to compute the parameter values corresponding to the various possibilities. This is a joint work with Frank Loray and Marius van der Put. Abstract: I introduce the sixth Painlevé equation PVI from the isomonodromic deformations of rank 2 Fuchsian system with 4 singular points over the Riemann sphere. Although the generic solution of PVI is very transcendental, special algebraic solutions can be derived from deformations of Fuchsian systems having finite monodromy group. I will give examples. 16:15 Thesis defense of Maint Berkenbosch in the Academiegebouw. November 5 Eindhoven. The morning program will take place in room 1.50 of the Matrixgebouw (accross the road from the main entrance of the Hoofdgebouw). After lunch we move to HG 6.96 in the Hoofdgebouw. 11:15−12:15 Sergei Haller (Eindhoven), Twisted forms of linear algebraic groups: some aspects of computation. Abstract [PDF]. Abstract: Recently discovered representations of the Artin groups of type An, the braid groups, can be constructed via BMW algebras. We introduce similar algebras of type Dn and En which also lead to faithful representations of the Artin groups of the corresponding types. These finite dimensional algebras have a chain of ideals Im such that the quotient with respect to I1 is the Hecke algebra and I1 / I2 is a module for the corresponding Artin group generalizing the Lawrence-Krammer representation. Some properties of other quotients are discussed which lead to abetter understanding of the BMW algebras and their dimensions. Abstract: Suppose that a finite group of order n has a complex irreducible character of degree d. Then there is a non-negative integer e with n = d(d+e), and if e is 'small' then the character degree d is 'large', as a function of n. The case e = 1 can be completely classified; it occurs for all values of n of the form q(q−1), where q is a power of a prime number. On the other hand, each fixed value of e different from 1 occurs in only finitely many cases; more specifically, one has n ≤ e4e2 whenever e ≠ 1. A proof of this result, obtained in collaboration with Noah Snyder (Berkeley), will be given in the lecture. Abstract: For a finite group G the representation ring and the center of the group ring are both reduced commutative rings whose additive group is free of rank c, where c is the number of conjugacy classes of G. When G is abelian the rings are isomorphic. In this talk we will compare the discriminants and the induced Q-algebras. November 26 Groningen, room 02 of Het Tehuis on the Lutke Nieuwstraat. 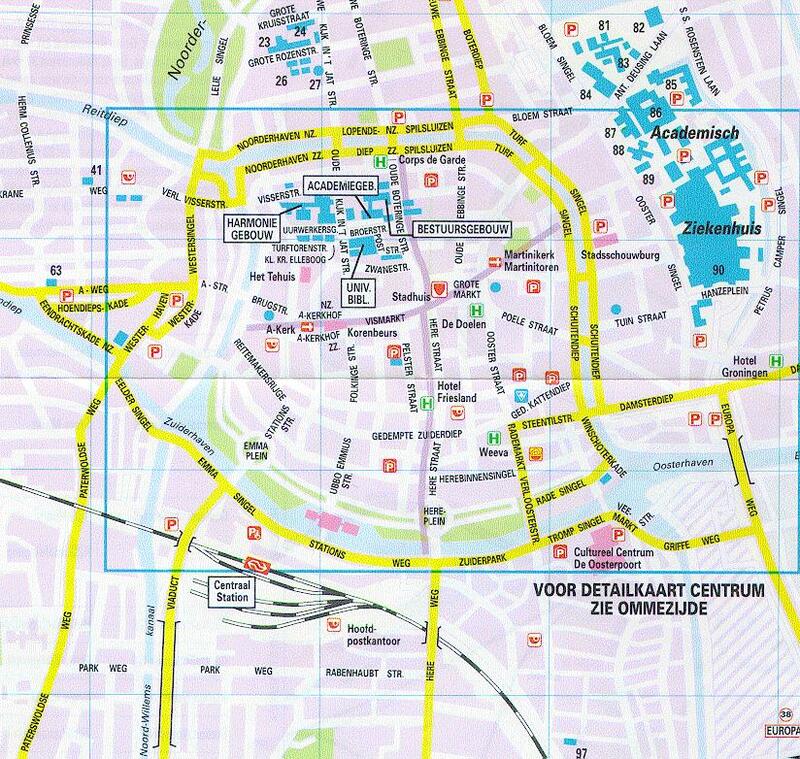 Het Tehuis is shown on the the map, just north of the A-Kerk See the map. Abstract: In the last two decades, we have seen that the number N of points of an elliptic curve over a finite field can be computed in polynomial time. This talk shows how to produce, on input N, an elliptic curve over a finite field for which the group of points has order N. If N is provided in factored form, the heuristic run time is polynomial in log N.